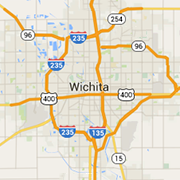 Check out Wichita's sports and recreation store. Swimming, camping, football, soccer, billiards and more. You'll find equipment, team memorabilia and specialty items right here. We provide archers with spot targets, indoor 3-D targets and elevated shooting platforms. We also carry a full range of archery equipment from Mathews, Hoyt, Easton and more. Wichita's indoor shooting range and one-stop-shop for firearms, ammunition, indoor target practice, gun safety training, and more.